I have really enjoyed this very unusual Amish series of books. The covers leave a lot to be desired, but the characters are great and the themes the books explore are endlessly fascinating to me. I do appreciate that while this is a conclusion to the story, there is no definite answer offered. Obviously, the characters come to a certain conclusion, but that was to be expected since they are based on a real settlement that happened. The book picks up where the last one ended. Some big things have happened that have to be dealt with. Miriam is in love with Domingo and they are going to get married which means she'll be banned. Jake killed a man but Rachel and Domingo have kept it a secret from him in order to guard his conscience. On top of that, they had a huge showdown with El Pantero and cannot be certain he is actually no longer a threat. In fact, when they find out he is a threat, they take drastic measures to try to combat it--only to discover that perhaps this solution is no better than living in danger. So that's kind of the bear bones plot, but there is so much interesting stuff going on. The series really examines ideas of the practicality of adhering to religious belief when your safety and livelihood is threatened. And there's also the conflict present in Mexico over the freedom of religion and what that means and what the "true church" is. The book is very rich in this regard and fascinating. Government vs. religion is a theme present in almost every storyline and whether or not there's any government can act as savior or be trusted a recurring question. The book also sets up the story for Levi's Will pretty well, which is the book Cramer wrote before this series. I kind of wanted to go back and reread it after reading this series because I barely remember it now, it's been years since I read it. I do recommend these books. 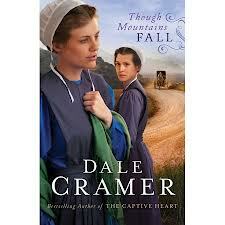 They aren't your typical saccharine Amish stories but instead really interesting historical fiction based on fact. The writing isn't quite as lovely as some other books but it is sufficient with some descriptions that were just perfect.